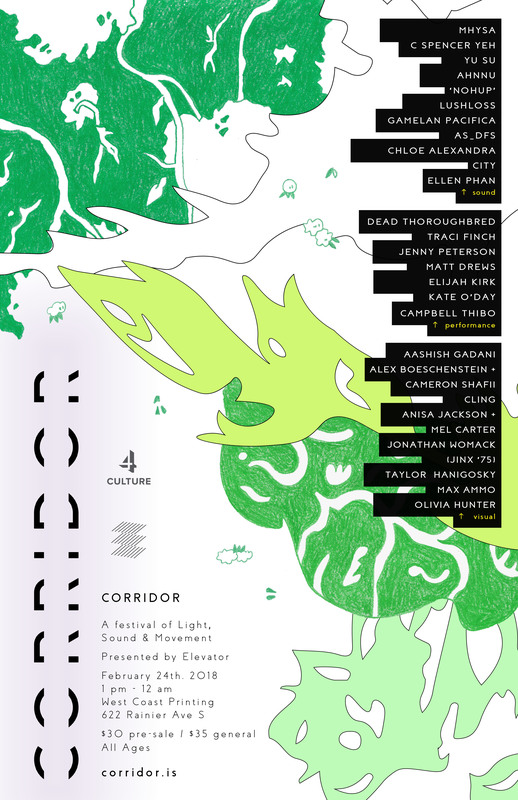 This Saturday, Feb. 24, marks the third annual Corridor, a single day festival featuring an array of experimental music, dance, and visual art. As with previous years, the lineup boasts a wealth of local and non-local talents from the spacious dance music of MHYSA to as_dsf’s spellbinding rhythms. Ahead of the event, KEXP reached out to one of Corridor’s organizers over at Elevator, Matthew McBride, to dig into the genesis of the event, their curatorial mission, and what newcomers can expect. KEXP: When did you first conceive Corridor and what’s the idea behind the event? Corridor started as an evolution of the Elevator concert series, which focused on avant-garde and experimental music, oftentimes electronic. We wanted to create something more immersive and durational. 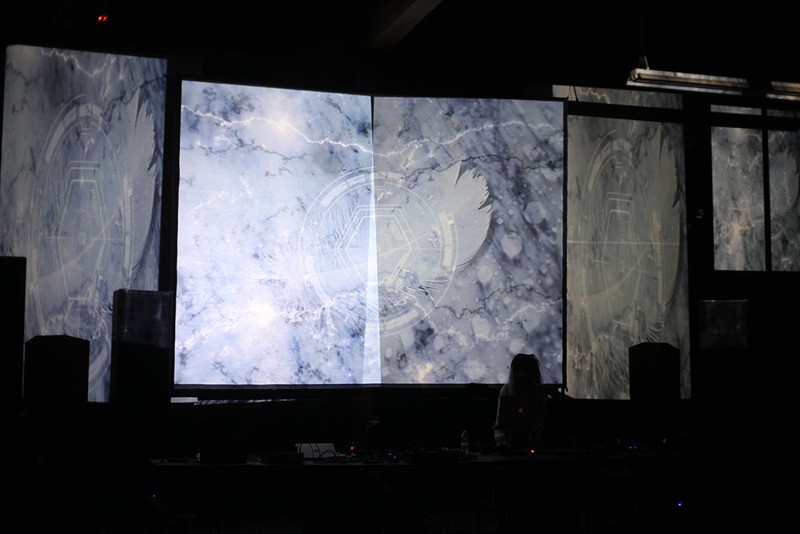 The first year of Corridor was 2016, and the format really hasn’t changed since - 12 hours of sound, with dance and live visuals presented in collaboration with the music, and a strong live visual and installation component. This year’s Corridor musicians run the gamut of genre, from MHYSA’s avant-garde dance music and Lushloss’ candid experimental work to the traditional Indonesian music of Gamelan Pacifica. What’s the thread that you think ties the lineup together and how did you approach the lineup from a curatorial perspective? We’ve always focused on booking underrepresented music that we love. There is an aesthetic thread through the whole event, but it’s hard to define. We try to represent a variety of different strains of experimental music, from more beat-oriented artists like MHYSA and City to purely ambient or noise like Ellen Phan and C Spencer Yeh. 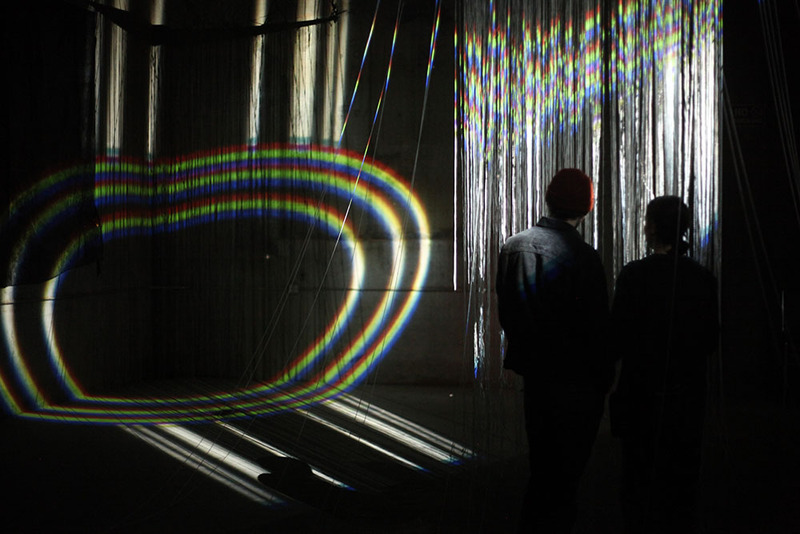 Corridor is more than just music with your art installations and dance performances. How do all these different art forms work together in the space? Is there any crossover between them all? Dancers collaborate directly with musicians – we’re interested in how to physicalize and humanize the abstract sounds that we are featuring. The art installations function as a continuation of a lot of the same expansive ideas being featured in sound, but in more of a gallery setting, outside of the concert hall – people get to reset by wandering through different environments, never settling into one rigid experience. You’ve mentioned on the ticket page that no one should be turned away because of lack of funds, offering volunteer options and discounted tickets. Can you speak a little bit to that decision and the importance of making the arts accessible to people? It’s very hard to ask people for $35 for a ticket to an event, but it’s also difficult when you’re in danger of not breaking even. That being said, an event should be accessible for anyone of any economic background, and we strive to make sure that anyone that really wants to can attend. For those who’ve never been to Corridor in the past, what can they expect from this year’s event? Or even if they’ve been in the past, what will be different this year? The space is the biggest change. Corridor has been in a different venue every year and that has a huge impact on the overall nature of the event. New attendees should expect a relaxed environment that lends itself to free movement throughout the space and an opportunity to interact with new sights and sounds, all at once overwhelming and tranquil. Corridor takes place this Saturday, Feb. 24, at West Coast Printing. Buy your passes here. Burger Records' annual festival, focused on woman-fronted groups, is hitting the road for the very first time this year! It pulls into the Crocodile this Saturday and Sunday.